Holiday spirit is in the air and one of our very own Wine Club Members has been spreading cheer for over 30 years throughout California. Meet Santa Bob. Here is his story, in his own words. My Santa career began with my first grandchild’s birth in 1984. Christmas came and I bought a really cheap Santa suit. One could almost see through it. As I held her in my arms she looked up at me and gave me a smile that brought tears to my eyes. 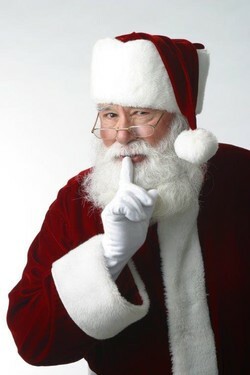 How could a four-month-old child know Santa? My son-in-law suggested that I pursue this. After the following Christmas as Santa, I bought some material and asked my daughter if she would make me a Santa suit. That’s how it all began. You will find me at the South Coast Plaza in Costa Mesa. This is my 15th season with them, listening to the wishes of children for what they hope to find under their Christmas trees. Each year on the first Saturday in December I work at the Mission Viejo Lake in Mission Viejo, CA. I’m taken to the security dock where I board the security speed boat and head for the beach part of the lake to meet several hundred kids and families. I’m there taking photos with them until the last child has had a turn talking with Santa. I’ve been doing house parties and company parties since 1987. Now retired, my wife and I are cross-country motorcycle riders. I ride my Harley to the Vietnam Memorial War for the Memorial Day Weekend. Usually there are more than 2500 riders. We begin in Rancho Cucamonga and end in Arlington, VA. We’ve ridden through most of the country spreading holiday cheer.